Hartlepool United boss Craig Hignett hit out at the decision to send off captain Nicky Featherstone during his side’s 1-1 draw with Luton Town yesterday evening. The Pools skipper was shown a straight red by referee Seb Stockbridge on 55 minutes for a studs high challenge on Luton’s Olly Lee, with his side leading 1-0 at the time. In my opinion what was a really poor decision has seen us with our backs to the wall for the majority of the second half. Hatters went on to dominate against the 10 men, netting a leveller through Alan Sheehan’s free kick with 12 minute to go, as an annoyed Hignett told the club’s official website: “It was a really good performance again. “In the first half it was nip and tuck – we started really well but then they came back in to it and we had to keep our shape really well and were hard to play against. “We got the goal at the end of the first half which was perfect and in the second I thought we came out and looked comfortable, and I felt like we would score again. “In my opinion what was a really poor decision has seen us with our backs to the wall for the majority of the second half. “But when we needed our defenders to defend they did that – the blocks that Toto put in were unbelievable but it was the whole back four really, they worked their socks off. 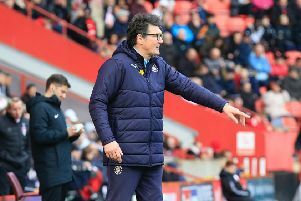 When asked for his view of the incident, Luton boss Nathan Jones said: “It looked a clear red card. When you raise your foot like that it does. “I’d have to see it again so I can’t commet, they think it might be harsh but it was a clear red card, for me. “I don’t want to get drawn on that because it’s something that I don’t have to get drawn on. “We’ve had enough problems with refereeing decisions in recent weeks, so I’ve got my lot full in that way.